Working independently, I’ve been aware of this for years – and I have used a point-source photography technique to study lenses. I’m not an optical engineer or scientist, indeed I don’t even have a degree in anything. I came into photography through Victorian books and teenage years experimenting with lenses, developer formulae, building my own equipment and using observation, corollary and deduction to understand how things work. It’s helped me explain difficult technical stuff to many thousands of readers through books and magazines, without using maths or formulae, and very few diagrams. In the quarterly magazine Cameracraft which ran for three years from 2012 to 2015, edited in conjunction with Gary Friedman who does have all the right qualifications but is also a dedicated empiricist and experimenter, I published a home-brewed rendering of aspheric moulding visual analysis. Here’s Sony’s visual showing the difference between traditional aspheric moulding (pressed glass aspheric, as pioneered by Leica and Sigma) and their new refined pressing with better engineering. This is a clip from a 2013 article in Cameracraft dealing with broader aspects of bokeh, depth of field, aberrations and how images are rendered. You can download the two-page article here. 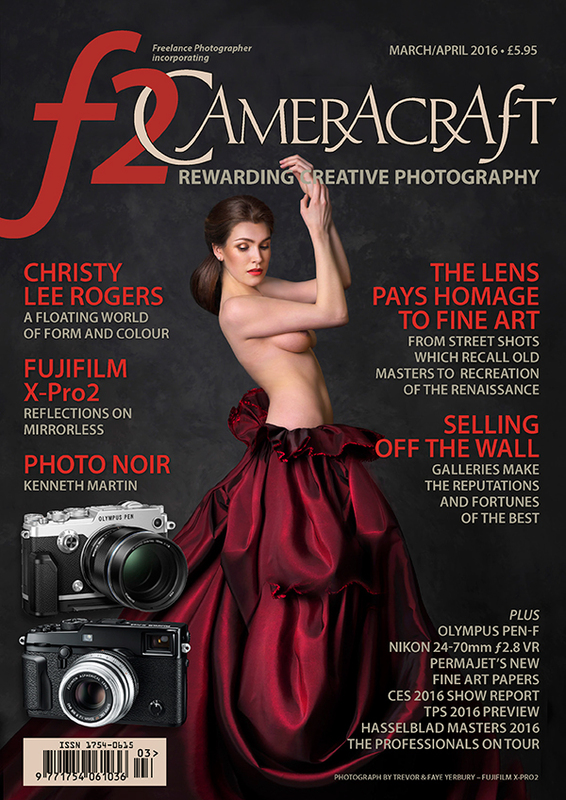 We’re sad that Cameracraft eventually ran out of funds, but it is now part of f2 magazine – heavier and more expensive, and not so ‘dedicated’ to the peculiarities and technicalities of our craft. If I can find a way round the title registration and distribution agreements, one day f2 Cameracraft will become just Cameracraft. It was a great title back in Ansel Adams’s day and it’s a great title still! Here is the full article as a downloadable PDF. As far as I can tell, Sony’s new superlens is not going to be any better than the Sigma 70mm f/2.8 macro which I still use. My reasons for choosing this macro are simple – it is optically excellent and traditionally made without any aspheric or other special elements, and it uses simple focal extension for focusing, not rear or internal group movement. This means it’s a true 70mm lens even when used at 1:1 and gives the maximum lens to subject distance, for its focal length. However, it’s going to be MUCH better than the Voigtländer 50mm f/1.4 used for the colour bokeh shift example at the top. Sony’s information makes it clear that the new more precise aspheric moulding allows new surface profiles and the elimination of chromatic aberrations which cause this magenta-green foreground to background shift in so many otherwise excellent lenses. I’ve said that to do so, the new lenses must be what would once have been called Apochromatic, though that term has only ever meant that all wavelengths focused to the same plane and at the same scale. Even past Apo lenses can show poor colour bokeh. It’s interesting that Sigma, after years of plugging the APO (capitals not actually needed, folks!) 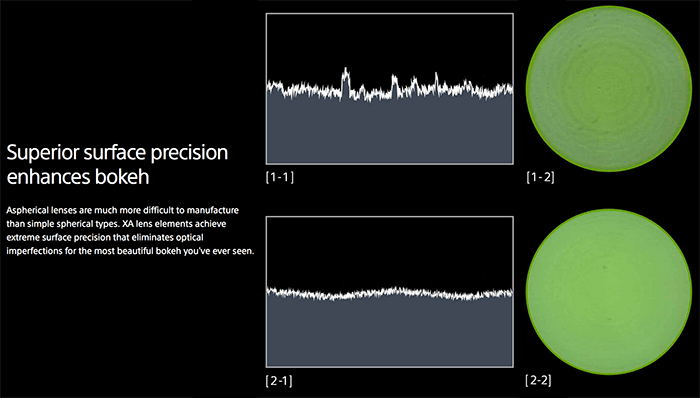 label chose not to label some new lenses this way even through their performance matched or exceeded earlier APO models. Sony seems to be taking the same view – G Master will be sufficient label to imply very high resolution, elimination of bad colour bokeh shifts, and by implication an apochromatic performance on RGB sensors. So will I be buying these amazingly expensive, large, E-mount dedicated lenses? Probably not. My unscientific observations tell me there are smaller, lighter, far less expensive lenses which will serve me better. Mirrorless digital camera bodies with high quality EVF and high magnification focusing allow me to do things I could never have done over 40 years ago when I took my first position as a Technical Editor (of the UK monthly Photography published by Fountain Press and edited by John Sanders). Geoffrey Crawley, editor of the British Journal of Photography, showed me how to evaluate any lens quickly with the help of a light bulb, a darkened studio, a roll of background paper and a sharp pencil. Back then you had to expose film, now you can just look through the finder. In a photo store, any LED spotlight will do for a quick check. Focus centre, magnified to max, at full aperture. Move to all corners in turn without refocusing, magnify each time. Refocus each corner in turn when magnified, examine change in rendering of point source. Buy the lens which shows symmetrical, balanced results and the best sharpness of the corners when the centre is correctly focused. Do this with a light source at least 3m/10ft away and if you can, even further. Repeat one stop down, two stops down, with zooms repeat at three or four focal lengths across the range. Never do it at close distance (hint: lens test chart results are only good for the distance you photograph the chart from, which is why Imatest, DxO and other labs have test targets the size of a wall and industrial sized space to work in). And, if you have a single LED bulb or miniature LED torch, you can examine any of your lenses in a darkened room and produce a ‘bump map’ which will reveal its moulding defects, scratches or fungus, blemishes, and population of dust and microfauna. For our PDF and App editions, go to Pocketmags where you’ll find Apple iOS, Android and all the usual choices to subscribe or buy individual editions. The next issue (below) will be delivered on February 10th. Gary – bellows or extension tubes are needed, unless the lens focuses very close (like the Sigma macro). You have to set up a single point source maybe 6-10 feet away from the camera, but focus the lens ultra-close so that a huge ‘Airey Disc’ (bokeh circle) is imaged on the sensor. The sharpness which which the moulding of the lens and other imperfections is imaged depends on the size of the point source. Sony probably have a special optical bench to hold a single element and a precision point source with exact light wavelength (etc). My technique records the entire lens, and also any filter, or the state of the sensor glass. If there were multiple pressed glass elements in the lens, it will show the combined effect. It is also possible to add a secondary lens – say a macro lens behind the lens you are examining, focused on the required surface. I noticed this first many years ago when tiny point sources in backlit images, like water drops on leaves, were showing a texture when out of focus. A perfect lens would have produced no texture. I then found the texture could be removed by cleaning the lens or filter! Geoffrey Crawley devised a whole set of tests, some published, some he just talked about and used, based on a point source in a dark room. He could view aberrations, actually measure CA and visualise coma, and also map camera shake (the point source recorded a tiny wriggly path on the film). He identified rotational camera shake and set out of the basic principles for all the stabilisation methods which followed. Geoffrey, who also founded Paterson Photographic with Donald Paterson and devised some of the best developers and other chemicals ever made, died in 2010 and it’s one of the UK’s great shames that he was never honoured (or as far as I know, offered any recognition of that kind). He should have been knighted. Of course he’s best remembered for his article on the Cottingley Fairies hoax; everyone knew it was a hoax, so he hardly ‘exposed’ Conan Doyle’s gullibility. What Geoffrey did was to track down the retouching girls from Leach & Company who made the fairy photos for fun. Almost everything else he ever did was more important!